For collectors and jewelry historians of vintage costume jewelry, we tend to think of the name, “Coro” to be synonymous for fashion jewelry. 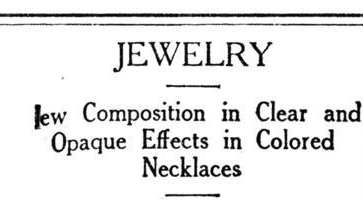 But in fact, the term “Coro” was initially used to call a new composite compound produced by Cohen and Rosenberger for its jewelry manufacturing. This material, used for the making of beads came in opaque shades of amber, ruby, sapphire, jade, and a transparent jet. It was 23 years later, in 1943, that Cohn and Rosenberg adopted the name “Coro” to be its corporate name.